The radical Islamist terror group Boko Haram attacked and slaughtered more Nigerian civilians in an attempt to cleanse Nigeria of Christians and the Western way of life. The group blocked a highway near the Nigeria and Cameroon border in the northeast, which is an area Boko Haram controls. The motorcycle-riding gunmen armed with Kalashnikovs blocked the highway near the town of Logumani, 30 kilometres (19 miles) from the border around 5:00 am, shooting and hacking to death 19 motorists and burning three trucks, they said. 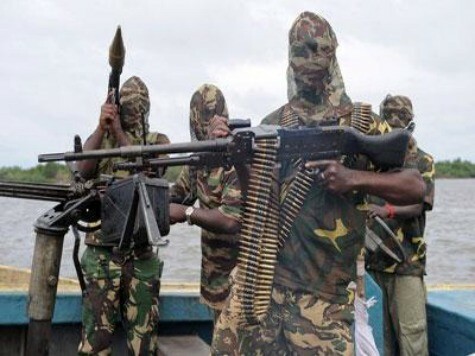 “We have recovered 19 dead bodies from the scene of the attack by Boko Haram gunmen,” Musa Abur, leader of a civilian vigilante group in the area told AFP. “Five of the victims, who included two truck drivers and their assistants, were shot dead while the rest were slaughtered,” he said. A survivor provided a chilling account of the attack. “We were asked to get out of our vehicles and lie face down by nine men dressed as soldiers who blocked the road around 5:00am,” the man who gave his name as Buba told AFP. “They shot dead five people and went about slaughtering 14 others before someone called them on the phone that soldiers were heading their way,” he said. “They abandoned the rest of us and sped into the bush on their motorcycles,” added Buba who was shot in the leg. In September, the United States Commission on International Religious Freedom (USCIEF) released a report that says Boko Haram is responsible for the attacks against Christians in Nigeria. Here are their findings from the past year. A total of 50 churches were bombed, burned or attacked, killing at least 366 people. Christians or people perceived to be Christians were attacked in 31 separate incidents, killing at least 166 people. Clerics or senior Islamic figures critical of Boko Haram were attacked in 23 separate incidents, killing at least 60 people. “Un-Islamic” institutions or persons engaged in “un-Islamic” behaviors were attacked in 21 separate incidents, killing at least 74 people. The group said the Nigerian government has the resources to fight against Boko Haram and protect Christians, but they choose not to. The United States government and churches are also silent about Christian persecution in all Muslim countries.